So while I was planning my engagement, there were a hundred different ideas in my mind regarding my engagement invitations. But to bring those ideas to reality a lot of investment was needed and I was not up for that. Here is a free app to design invites. So, when we start planning a function, we are not aware of the expenditure, time and effort that goes into every single detail. Something that looks very easy in your mind can be very difficult to achieve in reality. After arranging everything, we had literally no time to get physical invites designed. Also, the quote I got from invite designers to design a soft copy of the invite to go with my engagement theme was a little too much. 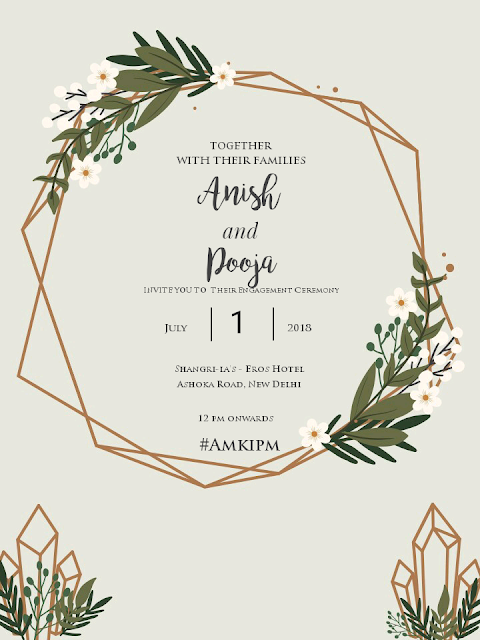 So I researched and found this app called Invitation Card Maker which basically is an Android app with some lovely free invitation card templates. No matter if you are going for colourful flowers or a modern eclectic theme like me, you will find a free template to go with your theme. Once you have selected the template, all you need to do is add your personal details and save the final copy. Invitations made on the app are high resolution and do not pixelate on being sent on wassup. If you are looking for free ways to design party invitation or free invitation templates then do download Invitation Card Maker. this invitation is so pretty. Thanks for sharing dear.